Clear the blocks aside the wired locked blocks in order to stay in the position they are in the beginning of the level. 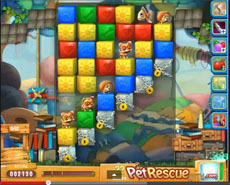 Clear the blocks under the pets and under the locked blocks, foreseeing the combination it will be created in order to rescue all the initial pets, after using a key. Maybe it is not needed to clear all the blocks under the locked blocks (as the video shows). It’s critical point (for the level’s completion) to rescue with a very few moves, after using the first key, the initial pets. After that clear the blocks under the pets that come above the screen in order to rescue them. Try to keep the wired locked blocks in the upper part of the screen and use the key at the suitable moment. Can’t beat Level 522? No need for frustration! Just focus on the helpful video below! It will show you how to complete the level!